I don’t know if I told you all this yet, but me and my hubby just celebrated our 9 year anniversary Feb. 19th. When we got married everyone told us not to go a honeymoon and to just save our money, so we did and since have always regretted not taking that chance to go somewhere really neat together. Over the years we have taken a few small trips here and there, but nothing big. So this year we are going to take a big trip. I have never been on a cruise, and my husband has. One of the only things he’s done that I haven’t. So he demanded that he take me one. We’re leaving April 6th and I will be gone for a whole week with no kids or responsibilities. Yeah, I could get used to that 😉 Not to mention, I guess the food is amazing, so… to be honest, that’s really what I’m looking forward to. So the moral of this story of mine is, I have to get my beach body ready. We’re going to the Caribbean, so I’m going to be in a bikini most of the week and want to be able to eat whatever I want. Meaning, most of my dinners for the next couple of weeks need to be on the leaner side. Don’t stress, I can’t go more then a few days without making some kind of a desserts, but, this is why I’m putting this, not so pretty, but super flavorful low calorie meal on here. There is really only so many times that I can have baked chicken, and this gives an amazing twist to chicken. It’s even more low calorie if you either don’t serve it over the rice, or if you serve it over brown rice instead, since white rice turns right into sugar in your system. Or so I’m told. 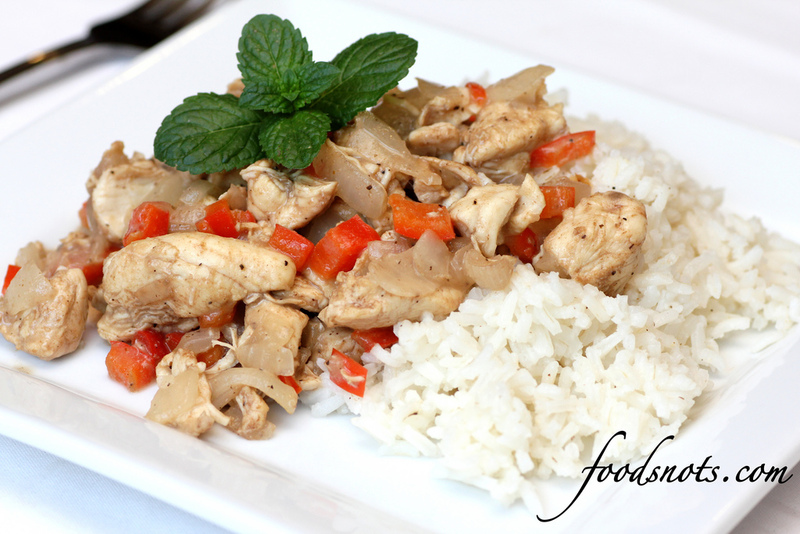 But, this meal is packed with flavor and is super fast and easy!! Enjoy! First, start cooking your rice. Add diced onion, red pepper, and minced garlic to a large saucepan and saute over medium heat until onions start to turn translucent. About 2 – 3 minutes. 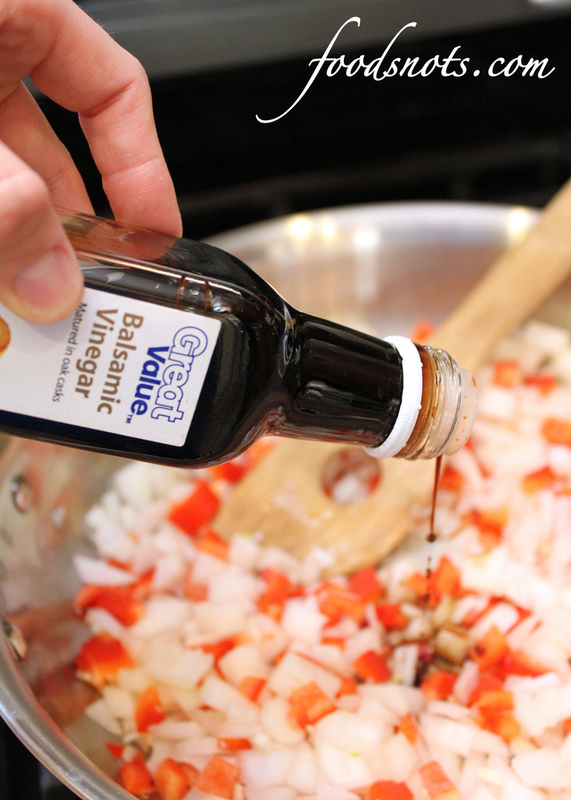 Add balsamic vinegar and saute for another minute. Turn up the burner to medium-high heat and add the chicken, pepper, and garlic salt. Cook until chicken is done throughout, about 5 minutes. Push the chicken/onion mix to the side, and add flour onto liquid at the bottom of the pan. Stir for a minute or two to allow the liquid to thicken. Add grated cheeses and stir in till you can no longer see it. Turn off the heat and add the liquid smoke. Make sure to stir it in so that the taste is even throughout. Let chicken sit for a minute to cool and let flavors combined. Serve over cooked rice.